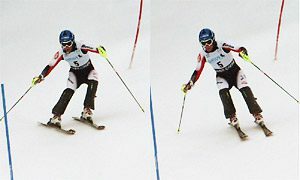 Open athletic stance with skis positioned wide. Basic stance generally stays the same (may change slightly to fit the terrain). No steps or stepping-type movements. Upper body is upright and slightly forward. Upper body position should not unfold or extend to resist the pressure built-up in the turn. 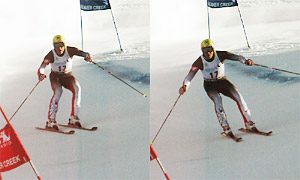 During the unloading phase in transition, the upper body remains in neutral position, while skis, legs and knees cross under the body into a new turn in pendulum-like motion. During the initiation stage pressure is building up mostly on the outside ski. Inside ski is also used troughout the turn and carries some weight. Upon entering the fall-line, pressure increases slightly (basic stance should stay the same or slightly more extended/stretched). Getting too far back should be avoided. 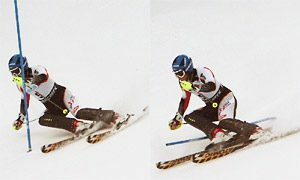 Exit out of the fall line and un-weighting of the skis are performed by a fluid transition from the outside ski onto the inside ski (the new outside ski). First understand the cause of the problem, only then try to correct it. Don’t point several mistakes at once. Don’t mention the same mistake over and over again. Include positive feedback into the criticism. It is very important to bring positive aspects into correction process. Give well defined tasks to correct mistakes. Psychological components: fear of speed, hill’s too steep. Turn initiation is performed too early or too late: lack of technical skills. 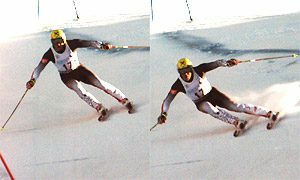 Movement of the entire body to the inside of the turn comes too early. Double pole plant on the outside. Active break at the hip. Run through straight upright gates without touching. Run through gates leaning to the outside. Use inside clear in straight upright gates. Use stubbys or markers for turn initiation. 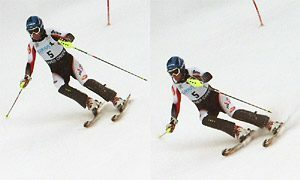 Grab to the outside leg in the points marked by stubbies. Keep a good mix of drills. 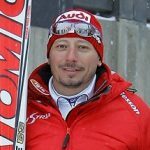 It is always recommended to do some free skiing in between the sessions as well as doing free skiing drills. 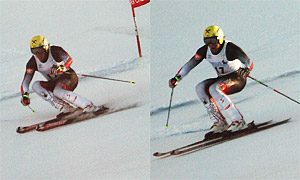 Have racer ski with some pads (ball, foam tire) between the knees. Set the course with stubbys and have racers ski over them (having stubbys go between the skis). 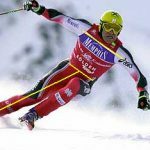 Have racers ski with the skis extra-wide (imagine to be a gorilla or tractor or train etc.). 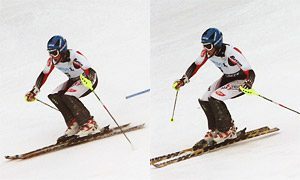 Have racers ski in tuck position by letting the skis «roll over» from one set of edges to the other while looking at the ski tips and keeping them apart. If snow is soft enough let them follow the wide track of another skier in front. Turning on the outside ski only. Keeping outside hand lower in the turn. 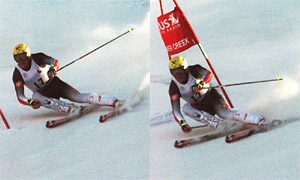 Pushing inside-ski forward / backward. Turns in the fall line. Keeping the ski tips level (on the same height). Check the equipment (boots, insoles, canting etc.). Focus on arms position, see if they are stretched too far forward/back. Have racers lean extremely far back/forward. Adjust and feel the appropriate neutral position. Use helper gates set above the gate and below it. Keep moving them further and further out of the fall line. Drills on holding an extended position or stretching movements. 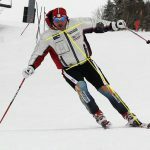 Drills in tuck position (if available over the rolls) working on active «pushing down». Drills on going straight in tuck position and getting into the turns. Set tight and «turny» course and use stubbys in different combinations. Set a simple course setting with turn-helper gates, emphasize active stretching (extension). Could be practiced in the rolling terrain (bend knees on top of the roll, actively stretch in the valley in between the rolls). Coming Soon: Part II of Austrian Coaching Method: Gate Training.